I have used this filter on outings with our Boy Scout troop where the younger boys don't quite have the patience for pumping and where we have a need for lots of water. The filter performs reliably. I agree it's somewhat slow - about 1l/min, but given that you don't have to do much to operate it, it's very convenient. Just hang it up from a tree at base camp, fill it with unpurified water, and let it go. The boys can filter gallons of water while they're doing other things like making dinner or playing cards. You definitely would not want to use this mid-hike waiting at the river bank for refills. This filter is not the correct filter for that purpose - use your pump. I am satisfied that the specifications for the filter are correct - 1 l/min and a filter life of about 200 gallons. * Be sure your water is mostly clean of silt and debris since it is not possible to backflush the filter. 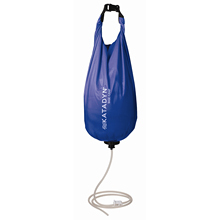 * Fill the filter from a collapsible bucket or other vessel instead of trying to use the filter bag itself to retrieve water from your source. * Hang the filter as high as possible (6ft) and collect purified water from as low as possible below the filter to maximize the water pressure through the filter. * If the flow rate starts to slow down, put a liter of clean water in the bag, shake it around and dump it out to rinse the filter and pre filter from silt and debris. Another positive about this filter is that it uses the Katadyn Hiker Pro cartridge, so it's easy to find a replacement. Not meant for day or thru hikes, but as the name implies, it's a really good gravity filter for base camping. Make sure you carefully seat the filter cartridge before screwing it in or you'll get leaks that have a tendency to run down the hose and contaminate your container. I hate pumping water, especially when base camping. Either you make countless trips to the creek/river/lake, or you spend a lot of time at water's edge filling as many containers as you have. The Katadyn Base Camp allows you to filter while setting up camp, cooking, or just sitting around enjoying your surroundings. I never hike with a big group — 4 people max — but I sill pack this gravity filter even when there are only two of us. I also take a cheap collapsible 2.5 gal. jug (Reliance for about $6 USD). Yes, I know it adds weight, but a lot of water with minimal effort is totally worth it for me. I've seen a lot of reviews that mention how slow it is and I'd agree. A lot of reviews also mention to make sure you let the water you're going to filter settle before pouring it into the Base Camp, and I agree with that too. I take a Sea-To-Summit folding bucket, fill it, then let it sit for an hour or so before filling the Base Camp. Using this method, I've managed to get about 140 gal. before my filter cartridge had to be replaced — a bit short of the manufacturer's claim of 200 gal. Since the filter cartridge is housed inside a nylon bag, it doesn't take much to crush it in a full pack so take care where you put it. I learned that the hard way and had to replace the cartridge which cost nearly as much as the Base Camp cost new! You'll also want to make sure you seat the cartridge correctly before tightening the cap, otherwise it will leak and allow dirty water to run down the hose or drip into your filtered water. It can be a bit tricky, but practice a few times at home and you shouldn't run into any problems in the field. Since I'm not a group camper, this filter is all about convenience for me. 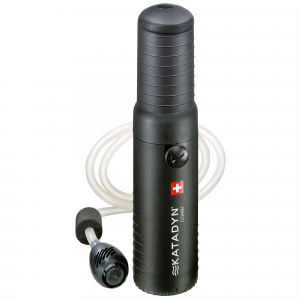 I frequently backpack into a base camp where I'll spend 2 or more nights and the Katadyn makes filtering my water a dream. I'm now on my 5th year with this filter and in spite of its drawbacks, I won't hesitate to replace it when/if that day comes. Thanks for the review, Utah Backpacker. I've been worndering about this filter for a while now. I'm definitely with you on not liking to pump water! I bought one of these for a trip to the Buffalo River and it worked great. Fill it up and let it go. We probably filtered 20 gallons of water with no problems. One potential fix for the problems people have noticed about it not working at first. I experienced the same issue when I first hooked it up to test. Nothing came out. I gave the bag a slight squeeze and voila...the water flowed. From then on, it worked well. Have used one of these for four years — approximately 60 person days, filtering about 2 gal. per person per day. That equals roughly 120 gallons. The filter got quite slow on the last couple of gal. but improved somewhat after cleaning the pre-filter. Hanging the bag as high as possible does make a big difference in flow rate. Have ordered a new cartridge. It sure beats pumping, although I always have my pump filter as a backup. On our last trip I discovered that the large plastic coffee containers from Maxwell House and (I think) Folgers are just big enough to hold the Base Camp unit and make a very good water scoop. Love my Base Camp gravity filter. Only wish it were a little more compact. They need a smaller one. I have used this for 2 full seasons of hiking and random other times, it really beats pumping. If you put dirty water in it will clog, but just filter water going in w/ hanky or skim the water off the top to get the cleanest. Also Katadyn advises fiilng w/ another vessel and letting the water settle this really helps. With the lid from my MSR dromedary bag in place of the filter it makes a great shower. Many many trips and large groups this thing has won the hearts of all who have had the pleasure of using it. Katadyn could actually make this bag bigger/longer maybe, that would be an improvement but it would be heavy. No more pumping for me. We just got back from a BWCA trip with this filter. We just got back from a BWCA trip with this filter. Our group of 9 used this exclusively for 4 days (with the exception of the last water bottle fill for the group). We used approximately 25 gallons over the time, and had great water flow for all but the last 2 or so gallons. We filled the bag from the middle of the (clear) lake and we were careful to keep the prefilter clear, and we allowed the water to fill a water bag (5 gal) so that we would make sure we did not spill the water and we could let it fill with us not present. I'd recommend the product as long as there was also a backup plan for the group. Having clean water was very nice, and not having to kill ourselves to do it was very very nice. The bag did get warm when in the sun, which could cause bugs to grow. We did carry a cleanable ceramic unit as well to make sure that if things went badly with this one that we would not be stuck boiling water. 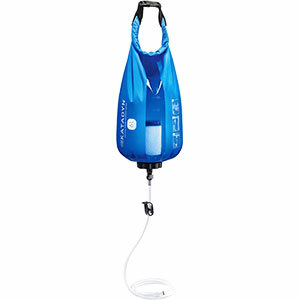 Spend your money on a second, cleanable, pump filter and you'll spend less time pumping than messing around with this bag of water. By the end the second fill of the bag, the filter quit almost completely. With clear clean BWCA water, filled from a boat in the middle of the lake, I expect much more for my money. Cleaning the filter as instructed netted 2 liters per day!!! good system. Much easier than pumping. Our Boy Scout troop packed into the Ozarks for 4 days. Fairly clean running water source. We were quickly and well supplied for the entire trip. Filtered approximately 60-70 gals... no problems. Great flow. Next trip was the Kisatchi area in Louisiana. Same filter. Water quality from the bayou was not nearly as good. Only filled the unit 2 times when it slowed to a trickle. Removed filter and cleaned with filtered water. helped for about three gallons. Unit may be able to use a ceramic upgrade which could be cleaned easier and prolong life. The cleaner the source the longer the filter lasts. Cleaning the current filter will only prolong the service life about 1 refill. We used this system on a ten-day, May canoe trip on the Green River in Utah. Eight people relied on the Base Camp, with a small ceramic filter as a back-up. The Green is a very muddy river. We began filtering fairly clear looking spring water, but soon had to filter some settled river water. The filter started out really well, but quickly flow rates were reduced to a fast drip, then a slow drip, then barely anything at all. We changed filters and resolved to filter only clear water. We augmented river water clairification using alum, which really helped. The filter still slowed significantly within about 20 gallons. The 200 gallon and 0.5L/min rates, quoted by the sales people, are very optimistic. Rather than a pleated paper filter, a field maintainable filter (perhaps ceramic) may be an improvement to the longevity system. 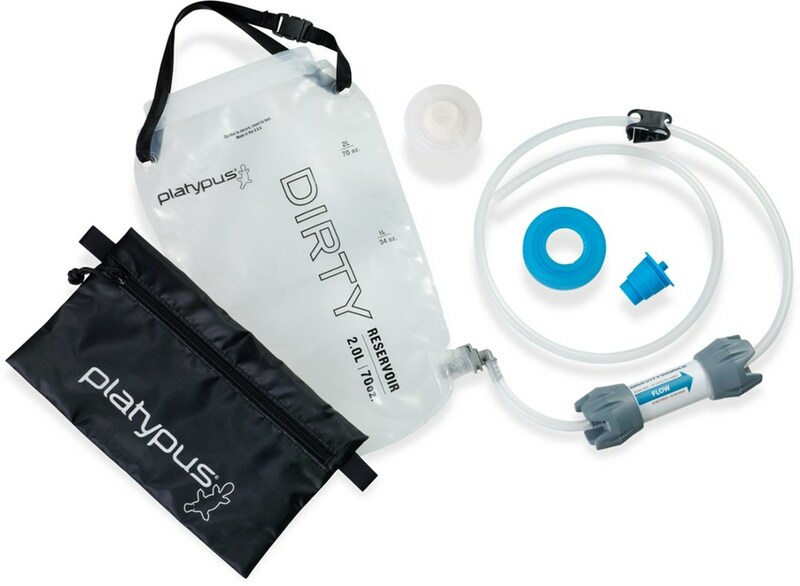 The Base Camp filter is a great concept and still beats pump filters for a larger group. Excellent filter for floating rivers in Alaska. I've been using the Katadyn Base Camp gravity filter for almost 20 years in Alaska. It works great as long as the water source is near camp...floating rivers or backpacking near alpine streams. Since it is a gravity system, above timberline I set it up in the rocks on a steep slope and stretch the outlet line as much as possible downhill to maximize the flow rate. I clean the filter after each trip by removing the prefilter screen, soaking in soapy water, and rinsing in clean water in the sink. At the start the pleats of the filter are typically muddy, and the end product is a clean filter which I air dry for a few days before packing away for the Alaskan winter. Worth every penny... The trick is to get water flowing. The trick is to get water flowing. I usually lift the clipped tube up and down a few times to start the siphon action before trying to pour. So I'm not sure that 1 liter per minute is accurate—once flowing, I can fill my two 1-liter Nalgene bottles pretty quickly. The one...sort of...complaint might be that it gets a little heavy and cumbersome to carry back from the spring or stream to the campsite. The first few times I used the bag required a lot of attentive hand switching—and I've since stashed the rolled up filter bag inside an ultralight daypack. Both roll to about the size of a 500ml bottle, and that fits nicely (between other gear) in the lower compartment of my pack. This filter device works great for weekend outings and extended trips. Hiking buddies and other hikers greatly appreciate the added capacity. While this is my go-to filter for extended adventures, I rarely carry (or need) it for one-nighters. All in all, I'm happy with the purchase. We used the filter on a BWCA trip and even with prefiltering the water with 4 bandanas and using 3 screen prefilters from older filter cartridges the unit clogged in just 20L of use. The only thing that saved us from boiling water was the reason I bought the system; the filter works in my Hiker pump. We did find that the filter worked fine in the pump. My plan is to put a Sawyer in-line filter on the bag. I like the large volume and ease of use. I just want something I can back flush and repair. If your Base Camp leaks, just wrap some plumbers (silicone) tape around the threads before screwing on the cap. In a pinch use a piece of a plastic grocery bag (they are almost as thin now). Works great, no leaks. I would like to get a replacement ceramic filter for mine. Anyone have a reasonably priced source for one? No way to tell if the filter is still usable. Filter clogs even with clear water. Needs a ceramic filter. Easy to use. Would like to see replacement ceramic filter at reasonable cost. Lightweight. I check it out before the trip, but never sure if it will work when needed. Feel like I always need a backup unit. Don't want to carry multiple filters, but not sure I can trust just one. No margin for error when you have kids with you. Or even when you are just a couple adults. No one wants to spend the hike out with diarrhea and vomiting. Need some gauge on the filter life. Can it sit unused for years and then be reliable? Do I have to remember how many gallons went thru it on each trip? That isn't how the average person works. Great in theory, could save your life in an emergency. Need to know that it won't fail when push comes to shove. After two weekend backpacking trips, I really liked this bag/filter. My buddy and I would fill it the day we got there, and it'd provide water for us both for the entire weekend. However, on the third trip it leaked where the filter goes into the bag. I returned it and got a new one and the new one never worked. I took this bag on two trips and both trips ended with the same result, using my buddy's water pump. Thankfully he brought his pump or we would have had no water. I followed all of the manufacturer's instructions, filled it with crystal clear, low (if any) sediment, High Sierra lake water. I'd hang it as high as I could, and after about 10 seconds of water flowing through, the water would stop flowing. No matter what I tried, I could not get water to come out. Very unreliable and I cannot trust this product. I use this on llama trips where weight is not an issue. I use this on llama trips where weight is not an issue. I love being able to supply water for the entire camp in a reasonable amount of time. I don't have unlimited free labor (scouts), so it's a real luxury item to me. I've used it for three seasons now and have no complaints! One of the first pieces of gear I look for when we reach a new camp. I can have a couple of gallons of clean water by the time I get all the llamas unloaded, taken care of, and get started spreading the gear around camp. I don't miss pumping unlimited amounts of water...nope, not even a little! Used on a five-day trip on the Green River in Utah. Used on a five-day trip on the Green River in Utah. Brought a bucket to "settle" water overnight, and then used a cup to ladle the clearer, top water into the Base Camp. Worked fine for the first five gallons; after that, was a slow drip. Overnight, we would get one liter of water. Cleaned the pre-filter over and over, and had to use precious filtered water (of which we had so little) to clean out bag and pre-filter. Thankfully, I had a Sweetwater Guardian and water purification tablets, otherwise we would have been screwed. 100 degree days, exhausting hikes up side canyons -- and not a drop to drink. I bought this filter primarily for use on Scout trips to make it easier to filter large quantities of water. It works OK and since our water sources are usually quite clean we haven't experienced the dramatically reduced flows other have. However I still think there are some flaws - the flow rate is still quite slow and I'm surprised there isn't any provision for a clean bag (add on extra) or at least a clean bag connector (e.g. for hydration packs) - to allow for true unattended operation. I have modified mine to be able to connect to up to 3 hydration packs with quick connect connectors and this simple change makes the utility much higher. Another issue is the difficulty hanging the system - with the buckle in the center of the handle its difficult to hang and several times the buckle has come undone leading to a real drenching. It is also very heavy to hang when full - so its difficult to hang high without a rope/pulley system - especially for my Scouts. I have also experimented using the same filter in a container below the bag and raising the bag much higher for more head - this gives much much higher flow rates - so the filter in bag seems quite a compromise for flow rate - though it allows a much simpler design. I find filling the bag from a creek is quite easy - except for the requirement to keep the clean tube out of the dirty water - it seems Scouts just aren't capable of doing this reliably - which is also a common issue for pump filters. This is unfortunate - carrying an extra remote fill bucket is extra weight. I do also think that while the dirty bag is extremely robust - really great for Scout use - its probably too heavy duty for most small group users - its heavy and difficult to pack down small. The first fill of the bag was fine. The filter was about as fast as pumping with a Pur Hiker. However, by the third fill it was down to a slow drip. Even after taking the filter apart and out into the lake it was very slow. At home I again took it apart and held it under the faucet to rinse any possible silt away. No luck. The water I used was pre-filtered through a hankie and was reasonably clean. I took the filter back to REI. Our group of 10 took a 7-day trip to the Boundary Waters canoe area and used the CERAMIC drip water filter for pristine water. Please note that there are two Katadyn filters that look identical with the blue bag. The best one is the ceramic filter which can be cleaned off for a total of 2000 gallons. The other blue bag camp filter has a polyester filter which is only good for 200 so BUYER BEWARE. A score of "5" for the ceramic! Wonderfull water filter. We used the filter on a 6-day 4-person boundary waters canoe trip. The filter gave us plenty of good clean drinking water without the fuss of a pump system. Gravity did the work while we fished. The filter did slow down after about 20 gallons of lake water purification. I suggest a spare filter cartridge for longer trips or more people. We did rinse the filter in clean water when we returned home and it did seem improve the speed of the filter once again. A group of us take annual trips to portage accessible lakes in the Canadian north and have used a number of different water 'cleaning' methods from water purification tablets to hand held micro-filter pumps. 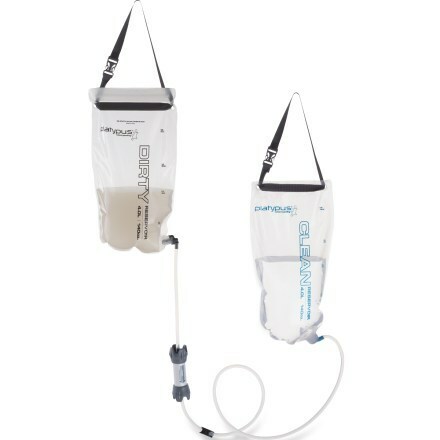 The idea of a system that allows bulk filtration (the bag) and instant use (tablets require 4 hrs of set time) was quite appealing. The instructions for the Katadyn Base Camp require that you prefilter approximately 2 liters of water to clean the filter of carbon dust that has settled in the filter. This is a normal procedure for any carbon based filtering system. The assembly of the system components is straight forward and uncomplicated. However, the bag did not come close to filtering the water in the advertised time frame. The water was left in the bag overnight and less than a third of the water had filtered out. I was certain that I must have left a protective wrapper on the cartridge filter yet upon inspection found that this was not the case. I checked on-line and found many favorable reviews of the product and a scattering of ones such as mine. My conclusion is that there must, at the very least, be an irregular quality issue with the product. It cannot, in my estimation, be trusted to deliver a safe and reliable source of drinking water. I bought this with the intention of using it for group trips, but I tried it out at home and couldn't get it to filter anything. Both myself and a fellow experienced backpacker, that have used 2-3 other water filters before - couldn't get this thing to filter anything. Based on the other reviews, it seems this product has some issues if most work but some don't.